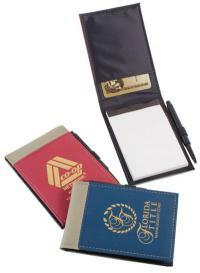 With your firm imprint or logo, our promotional portfolios, notebooks and note pads, make great promotional items. 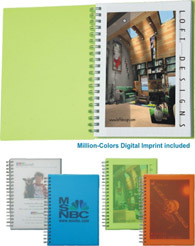 See our wide choice of portfolios, notebooks and note pads below. These items will make a big impression to promote your business by advertising with promotional products.. 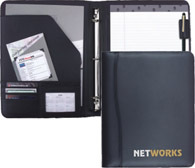 This means that everyone will see the portfolios, notebooks and note pads with your company imprint or logo, use them, and think of your firm when they need your product or business. It is also a great way to promote a specific event. Lowest price starting at: $6.23 each. Description: Features: * Leather-like cover with a full sized pocket on the front for easy access to important papers. * Front inside slip pocket with slot for notes. * Pocket with window for business cards. * Built in pen or pencil holder. 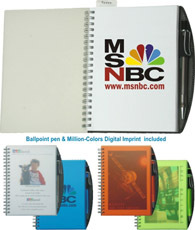 * 11-1/2" H x 8" W notepad included. * Actual size is 12-1/2" H x 9-3/4" W.
Lowest price starting at: $7.75 each. 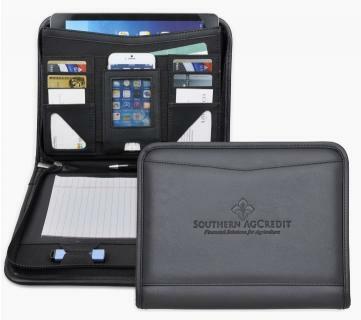 Description: iPad size business case/padfolio with zippered closure, iPhone pocket, internal file pocket to fit iPad or tablet, external file pocket, credit card pocket, USB drive holder and pen loop. Jr. size memo pad included. Material: Soft simulated leather. Lowest price starting at: $4.46 each. Description: Features: * Leather-like cover with a full sized pocket on the front for easy access to important papers. * Front inside slip pocket. * Pocket with window for business cards. * Built in pen or pencil holder. * Actual size is 8-3/4" H x 6-1/2" W.
Lowest price starting at: $6.22 each. Description: Features: * Smooth surfaced cover for the highest quality imprint with the stylish L-curve design. * Front inside slip pocket with slot for notes. * Two mesh pockets for business cards. * Built in elastic pen or pencil holder. * 11 1/2" H x 8" W notepad included. * Actual size is 12 1/2" H x 9 3/4" W.
Lowest price starting at: $7.67 each. Lowest price starting at: $3.96 each. Lowest price starting at: $2.52 each.